Very rarely I manage to sleep a whole night through and sometimes it does really bug me. I find that I would wake up about 3 or 4am for a loo break and then count down the hours I have left, till I drift off again. It doesn't matter what time I go to bed, how relaxed I am, how dark the room is or even not drink anything in the hours leading up to my bed time. I then came across the above picture (which looks so peaceful and childlike) and wondered how I would cope, in a bed in the trees for my early morning loo break. Such a gorgeous photo, it looks very tranquil, and easy to sleep in. I'm sorry you find it hard to get a full night's rest. too spooky for me! Looks like it could feature in one of the Twilight movies!!! It's almost kinda haunting! it does look nice and quiet and peaceful though. love your blog, so good and inspirational. You are gorgeous :)! I love this photo. 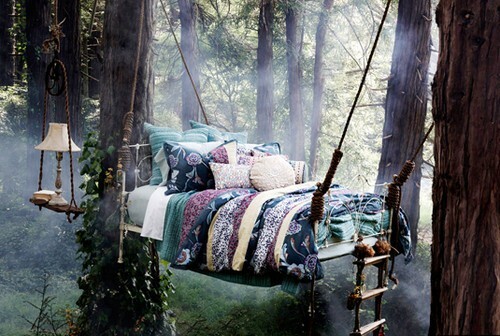 I actually have it saved on weheartit to use in a post about how I've always been enchanted with outdoor beds! Urgh! I hate loo breaks so much! I usually have to wake up at 7am for work, and my body decides it REALLY needs to pee at 6am, so I don't manage to get to sleep for another 15 minutes after I wake up. This picture is really serene though. I wish I had a little place which looked like that where I can have a long nap. I LOVE that you thought about needing the loo when you looked at this photo . . . I was expecting you to say that you might be able to sleep the whole night through if your bed looked like this. . . or something like that. When i see images of people riding in hot air balloons i think "what if i needed the bathroom way up there" and not "oooh, that looks like fun." You are a girl after my own heart. And that pic is so cool! I've never seen anything like it before! I know what you mean :( Yesterday the power went out before I went to sleep (I can't sleep with the lights off because I'm a total wimp -__-) And I was just awake for hours. When the power came on I felt right to sleep. How ironic is that? It's awful. I wish I wasn't such a 4 year old. I think taking a shower or drinking water helps fall asleep faster...I could just be making that up though :P You just need to find a routine to help you relax. Yoga, perhaps? Just found your blog, these post really made me want to take a nap..hehe, in a good way though. It reminds me of a fairytale and it looks so peaceful. I hate those nights I only sleep a few hours and I think I could sleep all day on a bed like this. Cute post! that would be such a dream! i really love your blog a lot and your kitty is sooooo cute. following now! I love that magical bed in the forest! Wow great blog! Visit my page!